HPGL, which is the short form for Hewlett Packard Graphics Language, is the file extension for the HP graphics plotter. Developed by Hewlett Packard, it is an open language vector graphics file format with an optimal file size and an accurate and fast rendering. The HPGL language is actually a set of instructions sent to plotter printers, which, on receiving this information, draws images using lines instead of dots. In other words, it tells the plotter where and what to draw on the page. The HPGL language is formed of a series of two letter codes, followed by optional parameters. For example, the code ‘AA100, 100, 50’ would tell the printer to draw an arc – the center of the arc being at 100, 100 on the page, with a starting angle of 50 degrees counter-clockwise. A fourth parameter can follow that will tell the printer how far to take the arc. All Hewlett Packard printers usually support HPGL. The programs that open HPGL files are IMSI TurboCAD, Corel Paint Shop Pro, ArtSoft Mach, and XnView on Windows; IMSI TurboCAD, XnView, Lemkesoft CADintosh, Lemkesoft Graphic Converter, and Cenon on Mac OS; and Cenon and hp2xx on Linux. 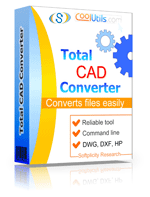 When you need to convert HPGL files to PDF, TIFF, JPEG or other formats use Total CAD Converter. This is a reliable solution to process cad files in batch.